Turton is an exciting Fire Water son out of an extra productive D040 daughter. We like this genetic combination almost as much as we like the completeness and balance of Turton himself! He's an impressive, sound, deep, thick, great patterned bull. 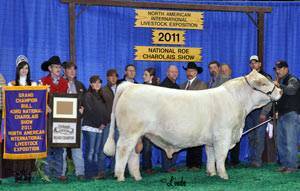 Turton is the 2011 NAILE Champion Bull.